South Devon’s Speech and Language Therapy Service is managed by the South Devon Healthcare NHS Foundation Trust and is coordinated from Torbay Hospital. After school club for pupils of St Margaret's Academy only. For parents of children under 5 years with a diagnosis of autism. It is a 3 month programme for 6 families at a time. It aims to compliment other services and facilitate parent networking. Research suggests that as many as 70% of children with special needs have a visual problem. Strabismus (squint) and nystagmus (wobbly eyes) are common, as is a need for glasses. A programme for parents, carers and professionals of children and young people with autism aged 9 to 14 years of age. Breakfast Club for pupils of Shiphay Learning Academy only. Breakfast for pupils of the school only. The Physiotherapy Department provide assessment and treatment for children from birth to 19 years old who have a physical or postural difficulties, for example, Cerebral Palsy, developmental delay, co-ordination difficulties and Down's Syndrome. Cheerleading for beginners through to competitions. Fun, fitness, dance and some acrobatics. To find out more about Personal Health Budgets and our Local Offer statement please visit our website. 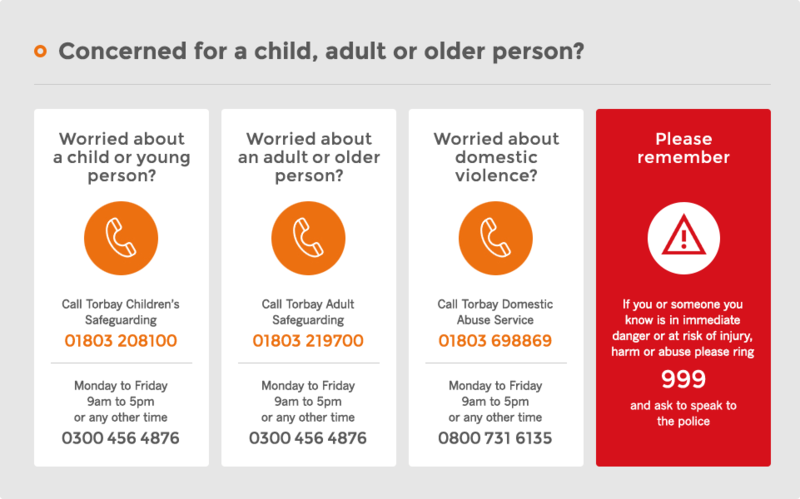 If you want to speak with someone about your own case, please call the Joint Commissioning Team on 01803 652500. Phab’s aim is to promote and encourage people of all abilities to come together on equal terms, to achieve complete inclusion within the wider community. We cater for kids, teens and young adults between the ages of 8 and 25 years old. This drop in group provides parents and carers with emotional support, advice and sign posting from experienced and familiar staff every other week and is running during the holidays. Our nursery is in the grounds of Watcombe Primary School, in Moor Lane. It provides an attractive and safe environment which provides varied and interesting activities that meet the child's individual needs. Sailing opportunities and facilities for people with disabilities of any sort. Lifework's Kool Club is a Saturday club for teenagers and young adults with learning disabilities aged between 14 and 25 years old. There are clubs at Totnes and Paignton which meet fortnightly between 10 am and 4 pm. Offers support to all people with MS, including those awaiting diagnosis or newly diagnosed and their carers, children and families. We cover a huge area including Teignbridge, Torbay and The South Hams. The Independent Living Centre provides impartial advice to help people of all ages with a variety of needs and disabilities make their own choice to improve their quality of life and independence. Fair View Lodge is a residential service to support the specific needs of people with autistic spectrum conditions to enable each individual to reach their fullest potential within a safe, structured, stimulating environment. RNIB offers practical support and advice to anyone with a visual impairment or blind. The transcription service provides print in audio (CD and DAISY), large print, braille and e-text for individuals and service providers. The ROVIC service is part of the Devon Integrated Children’s Service (ICS), commissioned to work across settings and in partnership with health, social and education professionals.